It is due to inflammation of the tendons and tendon sheath around the base of the thumb leading to pain in the thumb and wrist. Pain in thumb and wrist, worse while making fist, grasping and twisting movements. Catching or snapping sensation while moving the thumb. Difficulty in moving thumb and wrist. 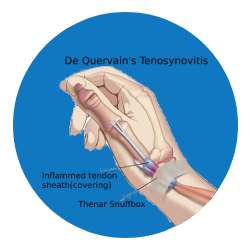 Release of tendon sheath at the base of the thumb.